The Sping 1996 issue of NYC DOC's On the Gate featured a half page about the Rikers Island detention facility named in memory of C.O. George Motchan. PLEASE NOTE that inmate population and housing unit arrangements mentioned in the article reflect conditions that prevailed in 1996. 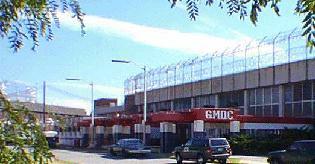 Current inmate population and housing configurations at GMDC may differ materially. The George Motchan Detention Center on Rikers Island. (Spring, 1996) -- The Rikers Island facility formally dedicated [in 1989] to the memory of slain Correction Officer George Motchan is now among the city’s largest jails, with an inmate population averaging about 2,300. It did not start out that way. When Mayor John V. Lindsay and then Correction Commissioner George F. McGrath officially opened it June 18, 1971, the structure was designated the city Correctional Institution for Women. The facility had been built to replace the four-decades old, obsolete and overcrowded House of Detention for Women in Greenwich Village. The $24.2 million project, begun on 55 acres in 1967, was labeled with a construction reference code “C-73” by the Department of General Services. That tag survives to this day in Correction shorthand. Designed for about 750 detainee and city-sentenced women, it housed only 400 female inmates at first. To relieve population pressures at other facilities, some C-73 excess capacity was made available to adolescent male inmates. As the institution expanded to help meet the system’s inmate population increases, a decision was made to build a newer Rikers jail for females and to convert C-73 into an all male facility. The Rose M. Singer Center was opened in 1988 as DOC’s new jail for female inmates. RMSC’s first warden, Robert J. Brennan, became GMDC warden in 1994. Today some GMDC units are “on loan” to RMSC. One factor in C-73’s role accommodating inmate overflow is GMDC’s sharing a common perimeter fence with RMSC and the Adolescent Reception and Detention Center. The sprawling enlarged complex consists of 50 separate housing areas: 18 structures containing cells, two dormitories, 19 modules, an infirmary and 10 Sprungs (plastic-covered aluminum framed domes).